Savoy and white cabbage cross. Cabbage 'Violaceo di Verona' is a drop dead gorgeous semi-savoy cabbage. This popular Italian heirloom from the region of Verona in Northern Italy is a cross between a savoy and a white cabbage that has been preserved for its beautiful looks and its fabulous flavour. It is a very striking plant, producing crinkly, tender leaves that are blue-green with a pink flush and creamy white in the centre. Cabbage 'Violaceo di Verona' has an excellent flavour. Mild and pleasant, young growth can be cut finely and used in salads and immature flowering stems can be cooked like broccoli. Mature heads can be harvested from early summer until mid-winter with successional sowings. Suitable for year-round production, Sowing in spring for harvest in summer-autumn, and sow in summer for harvest in winter. It needs around 100 days to grow from seedling to forming a head. Space 50 to 60cm (20 to 25in) apart. An ideal choice for an autumn to winter harvest. Frost hardy and long standing it holds well in the ground during cold weather and can stand well into the new year in moderate temperatures. As the cold weather begins, the taste improves and the contrast of colours of the leaves gets brighter. All brassica crops grow best in partial-shade, in firm, fertile, free-draining soil. Start digging over your soil as soon as you can brave the elements. Remove any stones you find and work in plenty of well-rotted manure or compost. Tread on the soil to remove air pockets and to make the surface firm. Brassicas will fail if the soil is too acidic; add lime to the soil if necessary, aiming for a pH of 6.5-7.5. Nearly all brassicas should be planted in a seedbed or in modules under glass and then transferred. Seeds should be sown thinly, as this reduces the amount of future thinning necessary and potential risk from pests. Sow seeds 1.25cm (½ in) deep and space 15-20cm (6-8in) between rows. Once they have germinated, thin the seedlings to 7.5cm (3in) between each plant. Cabbage seedlings are ready for transplanting when they are between 6 and 8cm high (2½ -3in). Water the day before moving, and keep well-watered until established. Use a cardboard collar around the transplant, against cabbage root fly, and some protection against slugs where necessary. The trick to growing cabbage is steady, uninterrupted growth. That means rich soil, plenty of water, and good fertilization. Cabbage needs fertile soil and adequate moisture from the time you set out transplants. Stunted plants don't recover. 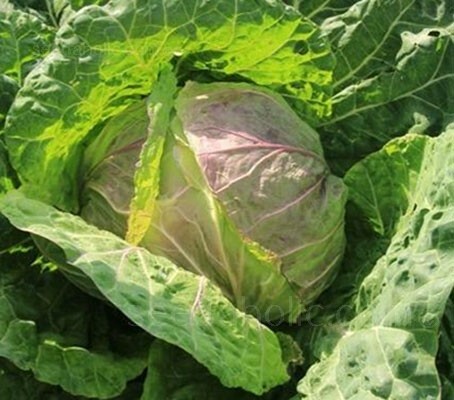 Cabbage that matures in cool weather is deliciously sweet. Test the head's solidity by squeezing it. Cut the head from the base of the plant. If you want to experiment, you can leave the harvested plant in the garden. Sometimes they develop loose little heads below the cut that are fun to serve as mini cabbages. Heads keep for several weeks in the fridge. Brassicas are affected by a wide range of pests and diseases, especially the fungal disease, club root. Remove any infected plants from the ground and destroy. Make sure the soil is adequately limed and well drained. Rotate your crops, planting brassicas, of any kinds, in the same ground more often than once every four years runs the risk of club root infestation and once you have it, the ground is useless for up to a decade. Don't take needless chances, even with "catch crops" of radishes. Also useful: Sage, Oregano, Borage, Chamomile, Calendula and Nasturtium. Cabbage is known botanically by the name Brassica oleracea variety capitata, which translates to "cabbage of the vegetable garden with a head." The genus name Brassica derives from the Celtic ‘bresic’. The species oleracea refers to a vegetable garden herb that is used in cooking. Blue-green with a pink blush. 50 to 60cm (20 to 25in).